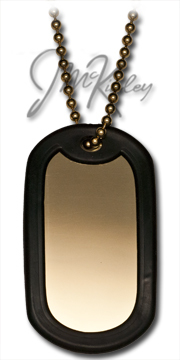 These are beautifully crafted gold dogtags. 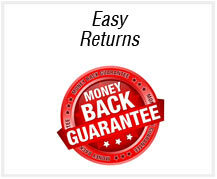 We offer these in several thicknesses to suit your particular taste. 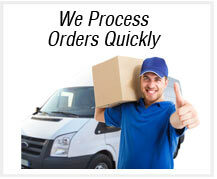 We also offer engraving. 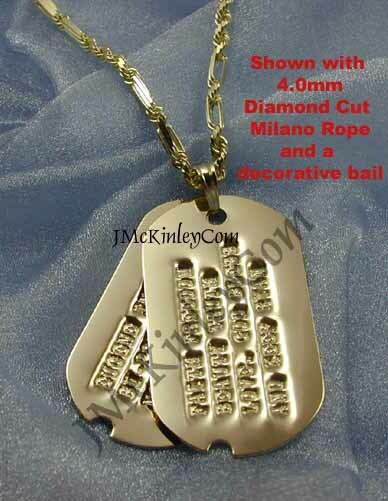 Engraved Dogtags are a great way to wear something dear to your heart. 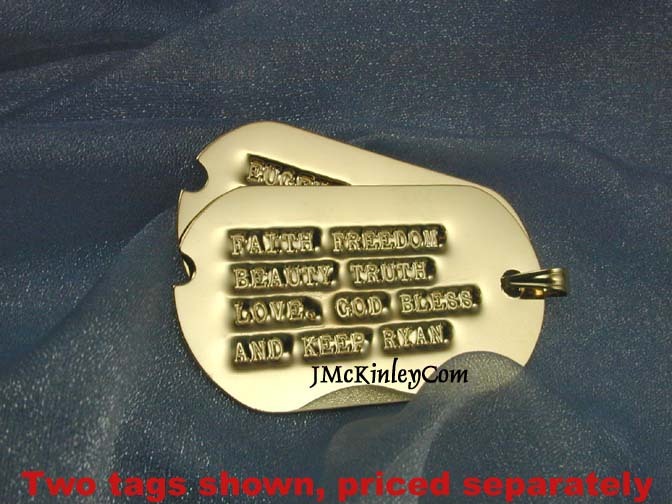 With such great engraving prices, many customers engrave both the front and the back of the dogtags. 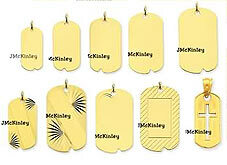 We have designed a beautiful line of high quality gold plated dog tags in order to offer smiliar looks at great savings. 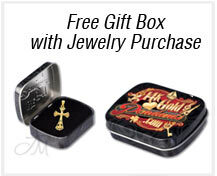 While 14k gold is a great investment, we now offer more affordable options. 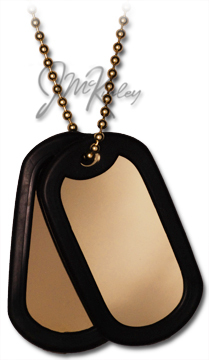 Here are some options for gold dog tags with silencers, available in black or red. If you like these looks, add the tags and chain to your cart, and ask for the complimentary silencers in the comments section of your order form. 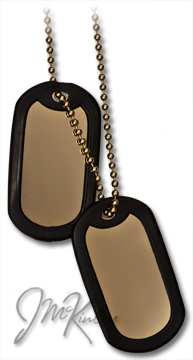 Note, the silencers can slip more on gold tags, as it is more shiny than military aluminum tags. 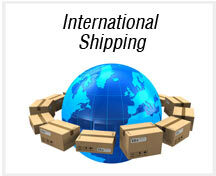 Also, it will reduce the available space for personalization. 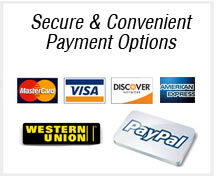 Measures 1&1/8 inches wide by 2&1/8 inches tall, 24 gauge thickness (approx .020 inch). Bails and chains sold separately. Because there is no slash, dates must be separated by a dash. Measures 1&1/16 inches wide by 2 inches tall. 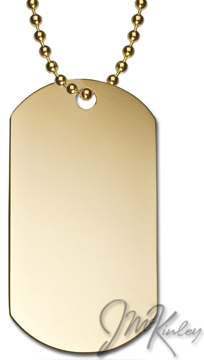 This stunning tag comes polished on both sides. Bails and Chains sold separately. Note these tags are .002 difference in thickness (2 thousandths of an inch). 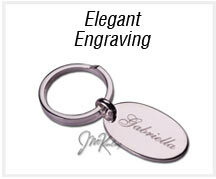 So if they are engraved or debossed as a set, in our opinion it is not obvious they are not the same thickness. 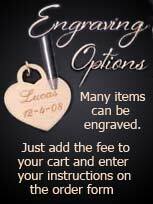 If you have any reservations, please order them without personalization, then return them for debossing or engraving.